After 80 previous attempts to capture a short track NASCAR Cup Series win, Martin Truex Jr. can now mark that item off his bucket list. Piloting the No.19 Toyota Camry, Truex conquered the .75-mile D-shaped oval to win Saturday night’s Toyota Owners 400 at Richmond Raceway in Richmond, Virginia. The Floyd Central High School duo of Zach Rose of Prestonsburg, Kentucky, and Cameron Crider of Dwale, Kentucky, brought a five-bass limit to the scale Saturday weighing 16 pounds, 10 ounces to win the 2019 Bass Pro Shops FLW High School Fishing Lake Cumberland Open. The second wave of Junior Rifle talent has descended on the Olympic Shooting Center in Colorado Springs as the Women’s Rifle competition begins this week at the National Junior Olympic Shooting Championships (NJOSC). Today, through August 31, you have the chance to enter the Steyr Elite Experience of A Lifetime Giveaway. Three lucky winners will each receive a Steyr rifle and an expenses-paid training course at Steyr Academy. SIG SAUER, Inc. announced that it has partnered with Black Rifle Coffee Company for the April “Big Game Giveaway.” This month long sweepstakes features a complete award-winning SIG SAUER Electro-Optics BDX System including a SIERRA3BDX 6.5-20x52mm riflescope, KILO3000 BDX Rangefinder Binoculars, and an ALPHA2 Mount. No fish kills, no respiratory irritation and no Karenia brevis organisms in sampling were reported anywhere on Florida's coast this week. Viridian Weapon Technologies is exhibiting the FACT Duty Weapon-Mounted Camera at the Minnesota Chiefs of Police Association’s 2019 Executive Training Institute and Law Enforcement Expo, held in St. Cloud, Minn.
CITADEL will be exhibiting at Legacy Sports International’s booth at the NRA convention. The firm will have their new products on display including the Warbird M1911, made using Cerakote laser image technology. Sturm, Ruger & Company, Inc. (NYSE: RGR) introduced six new PC Carbine configurations including three free-float handguard models chambered in the popular 9mm Luger and three standard models offered in the highly anticipated .40 S&W chambering. Whether heading to the public fishing pier or secluded backcountry streams, Plano's new A-Series 2.0 Backpack carries all the fishing essentials and keeps the angler's hands free to fish while on the move. Leupold & Stevens, Inc. announces the addition of Oregon resident and renowned long-range competitive shooter Jon Pynch to the company’s Pro Team. Pynch is a perennial contender on both the Precision Rifle Series (PRS) and National Rifle League (NRL) circuits – and is the NRL’s reigning champion. Kahr Firearms Group, an innovator in firearms design and manufacturing, is pleased to celebrate its 25th Anniversary this year. Designed by Kahr Arms President and CEO Justin Moon, the Kahr K9 offered a compact handgun that was comfortable to shoot, easy to conceal, and full of innovative features. A leading firearms manufacturer is seeking a dynamic forward-thinking Senior Design Engineer to join their team. The Senior Design Engineer will be responsible for handgun product designs from concept to production. The National Wild Turkey Federation applauds the confirmation of David Bernhardt as Secretary of the Interior. The California Assembly’s Appropriations Committee voted unanimously to support fishing licenses that expire 12 months after the date of purchase, a change that will provide greater value to anglers. Today, the Louisiana Department of Wildlife and Fisheries announced the season for the recreational harvest of greater amberjack will not re-open in Louisiana waters on May 1, 2019, as previously scheduled. NOAA Fisheries has informed the Department of Wildlife and Fisheries that the annual catch target for the Gulf of Mexico of 217,100 pounds is projected to be met by May 11, 2019, and that the season will be closed in Federal waters at that time. The Michigan Natural Resources Commission in Lansing acted to reduce the daily possession limit of lake trout in these waters from two fish to one. Here's a look at the spring reproduction ritual of six species popular with Georgia (and southeastern U.S.) anglers. The Missouri Department of Conservation (MDC) will offer a free, one-day Conservation Youth Camp for girls and boys from 8 a.m. to 5 p.m. on Friday, June 28, at the Hartell Conservation Area near Plattsburg. The Utah Division of Wildlife Resources (DWR) will be stocking fewer fish in some Utah waterbodies this year, but the fish will be larger. Michigan Department of Natural Resources Director Dan Eichinger announces Shannon Hanna has been named natural resources deputy for the agency, an appointment that will take effect following the May 31 retirement of Bill O’Neill, the department’s current natural resources deputy. Learn the basics of casting, tying knots, different types of equipment needed and what you need to get started at this free clinic. The bill creates an Arkansas Game and Fish Commission resident disabled veterans license that includes a lifetime combination hunting and fishing license, a lifetime Arkansas duck stamp and an Arkansas trout stamp. Governor Kay Ivey announced on March 29, 2019, the Gulf Coast Ecosystem Restoration Council (Federal Council) has approved Alabama’s State Expenditure Plan for Gulf Coast recovery. Immediately compatible with Lowrance HDS LIVE displays* – America’s Number One Fishfinder – LiveSight Sonar gives users the ability to track lure and fish movements in real time with a wider coverage area and at greater distances. On one of those “make-up” trips to the range, I took the Taurus TX22, an interesting full-sized striker-fired pistol with a 16 round capacity. It’s not the Taurus you’d expect in some ways. If you remember from the first mention of this piece in a Shooting Wire feature last month, it was fired during a range excursion meant to maintain compliance of retired peace officers under the Law Enforcement Officers’ Safety Act. The targets are large, a holster is mandatory and it’s more in the nature of shooting drills than precision – seeing what we can expect out of the pistol in handling. This time the goal was checking the gun with several types of ammo for accuracy. I’d taken only one brand/type of ammo, Remington Golden Bullet. It worked fine, there were no failures to fire and one stoppage which we concluded was shooter-induced. 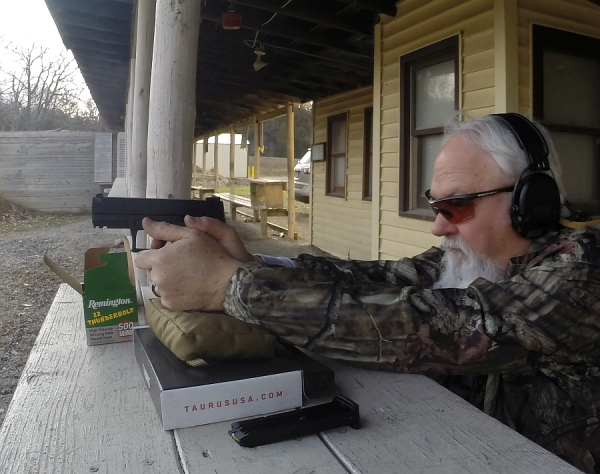 On this trip, I simply supported the base of the pistol on a bag over the pistol box, giving me the right elevation to center the sights on a 25 yard target. This time, the Remington Golden Bullet made the trip as did the same maker’s surprisingly good Thunder Bolt promotional ammo. A recent rimfire contender, the Federal Hunter Match has shown outstanding results in every gun in which it’s been tried thus far. 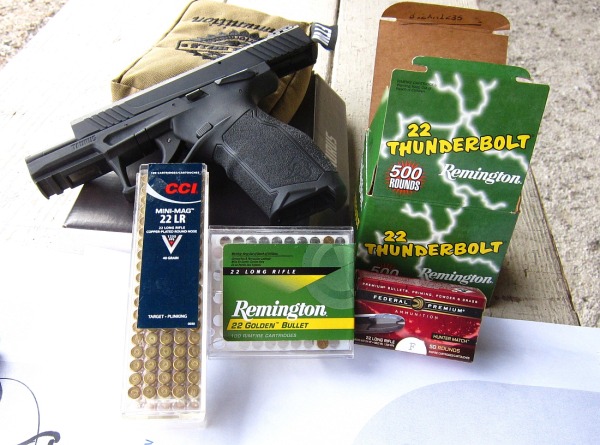 Additionally, a consistently good performer is CCI Mini-Mag. Readily available, more expensive than bulk-pack promo stuff yet not as pricey as the real premium target rimfire, it’s been the hunter/plinker’s friend for decades. As usual, I noted the five-shot groups fired slowly from a seated rest. I also recorded the “best three of five,” ruling out shooter errors – visual and trigger control. I also noted point of impact deviation from the sights as supplied without adjustment. The results follow. So what can we conclude? The gun can shoot more tightly than I can hold. As you can see, one load demonstrated vertical stringing. In this case, I believe it’s a compromised grip. A premium load, Hunter Match, didn’t so quite so well as the other loads; that’s the nature of 22 rimfire guns. They seem to demonstrate a definite character, real preferences for ammo. That’s why it’s worth the effort to shoot a range of ammo offerings, note the performance of each load in that gun, then lay in a supply of the top loads for each 22 firearm. I did not adjust the sights but left them to see where each load struck relative to the sights as shipped and relative to each other. Impact across brands was pretty consistent. Selecting the accuracy load and adjusting the sights for it would be my plan. As to operation, there were no more stoppages. I find myself hitting the protective shelf molded into the frame below the magazine release when I try to get the mag out; this isn’t a ‘gun problem,’ it’s a user problem. It’s a 22 range gun; just sort it out. Surprises thus far? The CCI Mini-Mag; it’s great ammo, has been for many years, but it really stood out in this heater. Another surprise was Federal Hunter Match: it’s been great in everything I shot except the Taurus TX22. Thunder Bolt has been turning in great performances in a number of handguns and rifles lately – across the board. For this TX22, it wasn’t the best choice. 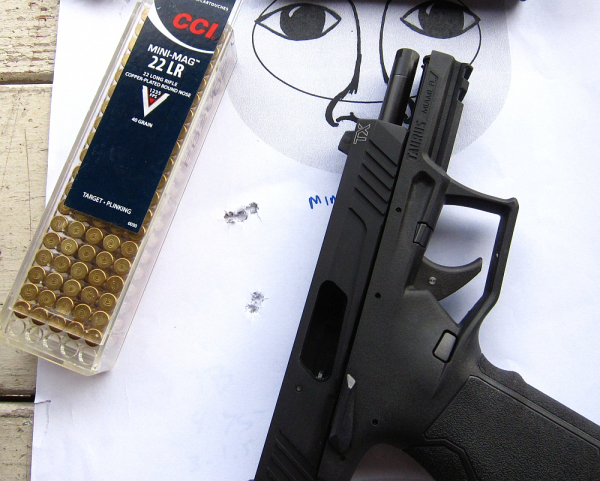 The Taurus TX22 is a credible performer thus far. They did their homework on this one.